I am working my way through the rest of the Easy Wood Tools products. This month I tried the Easy Detailer while turning a spindle and making a bead and cove with some other details which one might use while making a candlestick or a Windsor chair leg or a stair spindle. It works like a champ. I started with a piece of rough limb which had been lying around the shop for a good while. It was very dry and still had the bark on it, so I squared off the ends on the chop saw and then punched a hole in each end with the awl to give the drive head and the live tailpiece a place to bite. I mounted it in the trusty Oneway and turned the speed up pretty fast once I found it was balanced. As you can see in the attached video, I rounded it off with the Easy Wood Tools Full Rougher, which is turning into my tool of choice when I need to rough something out quickly and easily. 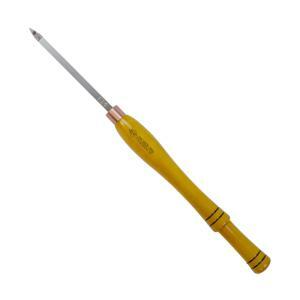 It is certainly my preference over a large roughing gouge since it does not bounce around when cutting and I don’t have to worry about sharpening. If it gets dull, simply rotate the tip to another side and keep on cutting. Watching the instructional videos on the Easy Wood Tools web site is the best way to learn to use the tools. I was interested to see how they use the Easy Rougher to start making a bead and/or a cove by using the corner to start a groove. You know already my apprehension about skew chisels and using this tool to start a groove is certainly a better option than my skew technique. After getting a bead or a cove started, the Easy Detailer is a marvelous tool. It has a slightly rounded point at the end of a triangular cutting head and lends itself nicely to making coves and beads. I was able to dig pretty deeply into a cove and the only limitation was the size of the tool. They make a smaller one which would be really nice on a finely detailed candlestick, for example. All in all, the Detailer is a fine tool and very easy to use. In addition, the Easy Finisher has a round cutter which may fit the bottom of your cove and make cleaning up any roughness a real “easy” task. Take a look at the video attached and see if the Easy Wood Tools from Highland fit your needs. Give them a try, and I feel sure you will like them. The more I use these tools the better I like them. I was having a difficult time cutting a bowl from Eucalyptus. This tool made short work of it and it came out extremely nice. Great job guys! !